I am officially in the holiday spirit and was looking for some ideas to change things up, and have found some great inspirations for inside and outside the home. I love this idea, especially for a holiday party or for Christmas Eve. I think the candles are so pretty, and especially lighting the way at dusk and into the dark. I have friends who do luminaries every year on both sides of their street, using paper bags, a little sand, and votive candles. The pretty site will definitely bring your neighbors outside. You can find some well-priced hurricanes at Amazon.com - modern straight walled ones, and more traditionally shaped ones with 12 hour votives. While the holidays shouldn’t be all about presents in my opinion, it’s still fun to see well wrapped packages. Having them illuminated outside is really fun and special, and a nice addition or change to lights on the house. I think scale here is important, and grouping them together will make the best impact. I have yet to find any for sale that look this good, so here are the instructions to make them courtesy of marthastewart.com. They called this one “holiday fence” and I love the idea. Simply using plastic garden edgers and white Christmas lights, you can bring the light all around your yard to celebrate the season and welcome guests to your home. I also love the simplicity of the lights in the windows shown here as well. So simple, and yet so elegant and beautiful. Use LED lit candles if you don’t want to worry about the fire hazard. Moving inside, here is a fun way to create a secondary tree in your house or even the main tree if a full tree isn’t in the plans this year. They suggest the hallway and I love that idea. Add a timer, and it will make your life festive and easy. You can make your own felt stars, or buy them here. I love pinecones, and making them the centerpiece in clear pedestal hurricanes (or any other glass vessel you have) is a great way to make a statement. I love the natural look, but for some sparkle (or to fit into a silver color scheme) you could spray paint them with silver paint like the ones in front. Here are some great hurricanes at West Elm. 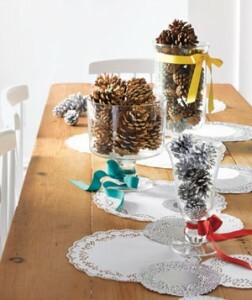 For the pinecones, if you can gather them in your area, so much the better. But if not, Amazon has some. This one is my idea. I bought this modern yarn wrapped Christmas tree from West Elm and the mini vintage ornaments from Restoration Hardware. I love the juxtaposition of the vintage and modern, and the tree has the advantage of being crafted by the fair trade women’s organization Rupalee. A variation would be putting the ornaments on red ribbon so they hang a little lower (it may yet still happen in my house). Every year I try to think of somehow creative to use holiday cards in my décor. For the last few years I have been using pinecones and sticking the pictures in them, but you can only fit so many in each one. I like this idea of stretching a string or ribbon between two vases or other décor elements and hanging the cards on them by clothespins. Sleigh or Jingle bells are such a characteristic sound of this season, and I think hearing them upon opening a door puts me in the mood. You could put this decoration up halfway through the season for a nice addition (and so you don’t go nuts with them before Christmas comes). An image to highlight the beauty of simple wreaths. These wreaths are often dried (so they can be used next year as well - a big bonus! ), and I love the natural simplicity in the season typical of excess. I love the sparkle of ornaments, and I do not typically have a full tree in my house. So I like putting them in some sort of centerpiece (bowl, long tray, etc). 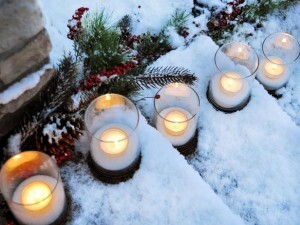 This year I interspersed them with green balls of moss and some twig balls, spread around a red & mercury glass votive. I love it. 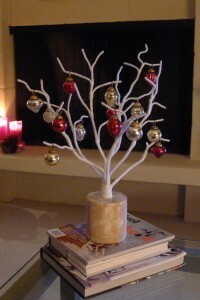 I love this idea for the Christmas tree base, using a basket instead of a traditional skirt. It’s a neat change, and I have seen it two ways. In this image they have taken a basket, turned it upside down, and cut out the bottom to put the tree base through. The other way is to have the basket right side up and put the tree in that way. 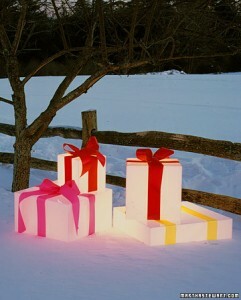 It decreases your space underneath the tree for presents, but I like the freshness of the idea.